Coffee's ubiquity in our daily lives can obscure a crucial fact: it's an agricultural product, a crop like any other, with a cycle of maturation and harvest that dictates its availability throughout the year. Luckily there's always a fresh crop to be had, since coffee is harvested at different times in different parts of the world, but it can be frustrating when your favorite type of coffee is only available for a couple of months per year. If you've ever wondered why single-origin coffees come and go from our store so frequently, this blog post is for you! Harvests in some regions last longer than others, depending on location and climate. Certain regions are additionally able to produce a smaller secondary harvest known as a "fly crop." Coffee-producing regions that straddle the equator—Ecuador, Brazil, Kenya, Sumatra—are able to harvest through much of the year. 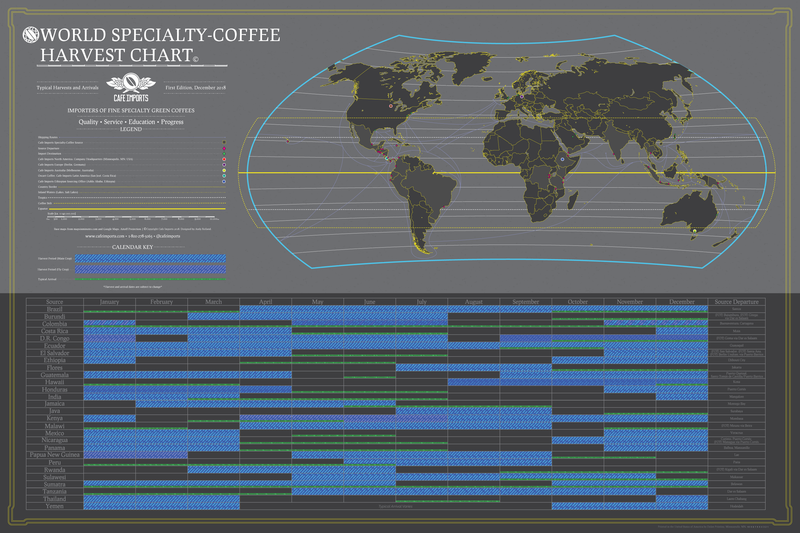 Elsewhere—Mexico, Panama, Ethiopia—the harvest period can be much shorter. Coffee is not ready for export as soon as it's harvested. First it needs to be processed and dried, which can take up to a few weeks, depending on the method. The coffee then rests in a warehouse for 60 to 90 days prior to hulling (removing the parchment layer that protects the bean). Then it is finally ready for export. Winter: Central Africa (Tanzania, Uganda, Burundi), South America (Colombia, Peru, Ecuador), Indonesia, Papua New Guinea. Summer: Central America (El Salvador, Guatemala, Panama), East Africa (Kenya, Ethiopia). Take this schedule with a grain of salt: anything and everything from weather, shipping routes, processing methods, and customs/certification holdups can affect arrival times. This year, various factors delayed the arrival of our Colombian offerings until the end of February, when they usually arrive in January. The longer green coffee sits, the more it loses its vibrancy and flavor. We buy relatively limited amounts of in-season coffees to make sure that we sell out of each offering before peak flavor fades. Coffee cherries, from immature to ripe, at Finca El Socorro in Guatemala. The characteristics of a particular coffee can change from year to year due to a wide range of factors: too much or too little rainfall, a cool summer or warm winter, etc. We often buy the same lots from our Direct Trade partners year after year, and the coffee is always familiar but never exactly the same. That's part of the fun! For instance, we roasted the first viable Java harvest from Finca El Socorro last fall, and we can't wait to receive the second harvest later this year to see how the lot has matured.